affordable rate with a guaranteed result! Beware of salons who charge way less... they usually offer "cluster" eyelash extensions (which is 5-10 eyelashes applied to one of your lashes). With clusters its too heavy for your natural lash and can eventually pull your lashes out, giving a possibility of that lash never growing back! 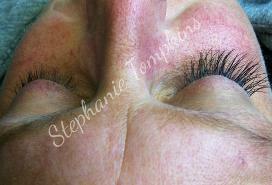 If applied properly eyelash extensions can last up to 6 weeks depending on the clients natural growth cycle. 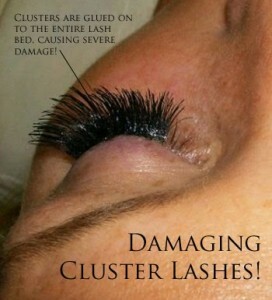 Each day we lose 3-5 natural lashes. Often they fall out unnoticed, but when eyelash extensions are applied, clients are more aware of when they shed as they are longer, darker, and thicker. Our adhesive is specially formulated with a unique waterproof bonding agent that lasts longer than most other adhesives. It is also medical grade eliminating the worry of being allergic to the glue. The cost of our lash sets are a bit higher than most places because we take the time to apply one eyelash to each individual eyelash. The average human eye can contain 100-150 eyelashes! Some places only put on 40-60 lashes per eye to keep their cost down. Although this looks good, it doesn't look as natural as ours and you may have gaps when they start to fall out. We provide the fullness you need and want. 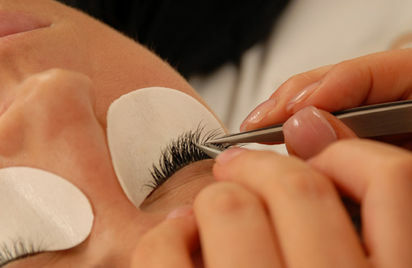 Applying eyelash extensions is a meticulous procedure and requires patience and concentration. It should never be rushed, so you should expect the first set to take approximately 1.5 - 2 hours and 45 min -1 hour for refills. 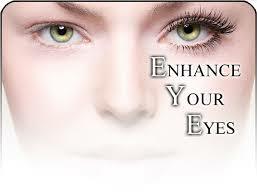 Clients can relax with their eyes closed, and there is no pain, as it is a non invasive procedure. Often clients are so relaxed they fall asleep!! Using different lengths, thickness, and curl types we provide not only the fullness but the natural look you need and want.